Joyce Meyer’s main theme is that although feelings can be very strong and demanding, you do not have to let them rule your life. Opening with a quote from Jonatan Mårtensson: “Feelings are much like waves, we can’t stop them from coming, but we can choose which one to surf.” Living Beyond Your Feelings shows you how. The answer, she demonstrates, is in making decisions not on your own emotions and feelings, but on God’s Word so that you can live each day with an indescribable peace and joy, enjoying a more stable life and more satisfying relationships with family, friends and colleagues. The practical guides and scriptural instructions are designed to help you make decisions based on biblical wisdom, not feelings, understand how your personality triggers your emotions, shed the guilt and fear from your past and grow into good emotions that stay in balance. Living Beyond Your Feelings by Joyce Meyer was published by FaithWords in March 2013 and is our 4249th best seller. The ISBN for Living Beyond Your Feelings is 9781444703306. Bible teacher, broadcaster and lecturer around the world, Joyce Meyer is the writer of well over eighty books, all written with the one intention, of helping ordinary people to reach their full potential as Christians. This title, as always drawing on her own life experiences and anecdotes of those she has met and counselled, concentrates, as the title infers, on feelings confronting emotions. Working through various emotions and situations that can overwhelm us, the author talks about them, analysing them and discussing them thoroughly, giving guidance on how we should deal with them in a life affirming way. Got a question? No problem! Just click here to ask us about Living Beyond Your Feelings. The average person has 70,000 thoughts every day, and many of those thoughts trigger a corresponding emotion. No wonder so many of us often feel like we're controlled by our emotions. Our lives would be much improved is we controlled them. 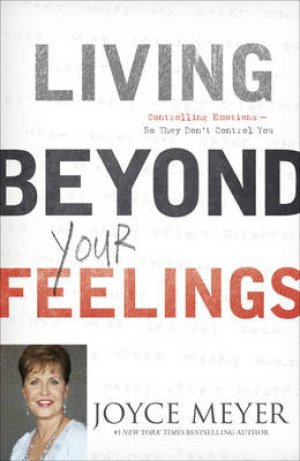 In LIVING BEYOND YOUR FEELINGS, Joyce Meyer examines the gamut of feelings that human beings experience. She discusses the way that the brain processes and stores memories and thoughts, and then - emotion by emotion - she explains how we can manage our reactions to those emotions. By doing that, she gives the reader a toolbox for managing the way we react to the onslaught of feelings that can wreak havoc on our lives. Chapter 1: I Want to Do What Is Right, but I Do What Is Wrong! Chapter 2: Why Am I So Emotional? Chapter 6: Do You Have a Pulse? Chapter 10: Can I Control Something for a Change? Chapter 16: Why Is It So Hard to Forgive? “This is a book I will recommend for everyone. It's life changing, renewing and refreshing. It teaches how to control your emotions and not let your emotions control you. It teaches that we should not rely on feelings as they are unstable. We can feel wrong, but choose right though it may feel wrong. It's such a powerful book to have in a library as one can refer to it anytime.” Other Retailer’s Review. “This book is very transformational when applied to your daily life. the beauty of "living beyond your feelings" is that it relates to you, its the reality of life, what you go through everyday and how you can make the best out of life.” Other Retailer’s Review.